Just before 2017 came to an end, Global Management Services was invited to have an early Holiday Lunch at the recently-opened restaurant—Bar Cargo. While Chicago is no stranger to pizza, Bar Cargo prides itself in being the new hot spot for Roman style pizza. We went with open minds and empty stomachs to put Bar Cargo to the test. Bar Cargo is the new addition to the Stefani Restaurant Group. This isn’t their first try at pizza, but it certainly is a fresh take, both in restaurant environment and the pizza-making process. The restaurant is reminiscent of a cargo container, a very industrial feel that can be seen from the garage doors that open in the summer to the “exposed” piping of the lighting and accents. The pizza, as we were told, has a specially-made crust which makes the pizza that way it is. Three different types of flours are shipped in cargo containers from Italy directly to the restaurant. Then after the dough is made, there is a resting period of 96 hours! Fortunately for us, we didn’t have to wait that long for our pizzas, but the resting period is supposed to give the crust a light, airy texture once it comes out of an imported “Castelli Foni” stone oven. We were soon to find out if the 96-hour crust would live up to its name. Drinks and appetizers are aplenty, the most popular one being the Bella Vita. Then we each got to try three different appetizers: the Hey Meatballs, the fried calamari with the arrabbiata sauce and the saffron aioli, and the Coccoli, which consist of fried dough, stracchino cheese and prama prosciutto. The combination of the beef and pork really made the meatballs very tasty and they went well with the charred bread when there was extra marinara sauce. The fried dough and the stracchino paired well together, along with the saltiness of the prosciutto. With the calamari, we almost forgot that we were still waiting for our pizzas. We finally got to try four different pizzas: the Margherita with tomato, basil, and mozzarella, the Arrabiata with pachino tomatoes, chili, and garlic, the Boscaiola with sausage and mushroom, and the Formaggio with provolone, parmigano, and fresh mozzarella cheeses. Although of the pizzas were all pretty good, the Formaggio was the overall favorite of the group, but the Arrabiata maintained its flavor the day after. 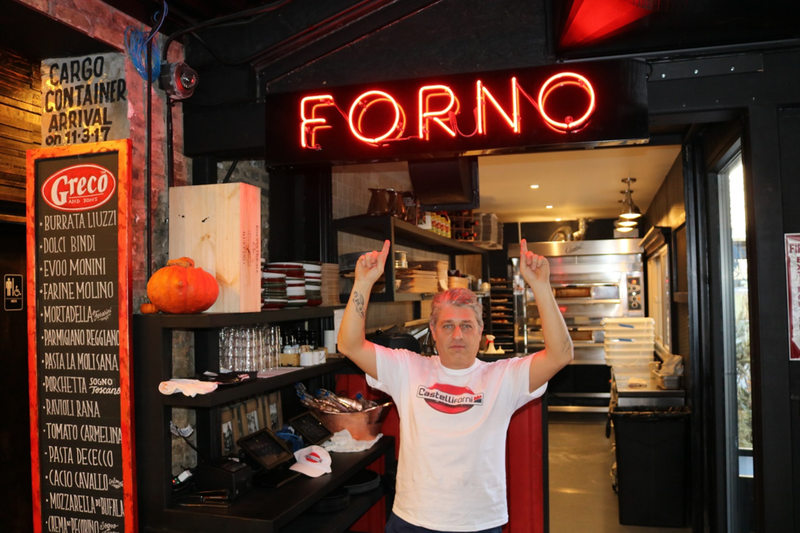 While we were eating pizza, we got to meet the man behind the 96-hour crust: Chef Massimo Moresi. A winner of the 1998 world pizza contest and having decades of experience with Italian cuisine, Massimo technique and skill really made the pizza shine. We even got to smell white truffles worth 1,500 dollars. Kept in a container of rice to keep the truffle dry, we each got to get a good look and smell of one of the finest ingredients in the culinary world. Just after we thought we couldn’t eat any more food came dessert. We got to try a slice of chocolate cake with vanilla ice cream and fresh, steaming donut holes with a rich chocolate dipping sauce. Many of the team members at GMS are known to have a bit of a sweet tooth; so dessert really hit the spot. The donut holes were so soft and fluffy, and the chocolate sauce only complimented them, while the chocolate cake was very rich and sweet. Although the food was great, what was even better is that Bar Cargo can host corporate events. The restaurant can accommodate up to 100 guests, 125 if the patio is included. They even have a New Year’s Eve celebration coming up if you are interested. Global Management Services had a great time at Bar Cargo, and we bet you would, too. Although deep dish will always be a Chicago favorite, don’t count out this Roman style pizza. For more recommendation for a holiday dinner, ask GMS for a proposal today.